Announcement Ahoy! On a Treasure Hunt for a special Gift? Welcome to our family Art Island. Whether you choose to dig in the Jewelry Treasure Chest dock search in the Fiber Bay or roam through the Wood Craft Jungle there is a lot to see and some great choices to make. Save a trip to the Mall and allow me to be your Personal Artist. Ahoy! On a Treasure Hunt for a special Gift? Welcome to our family Art Island. Whether you choose to dig in the Jewelry Treasure Chest dock search in the Fiber Bay or roam through the Wood Craft Jungle there is a lot to see and some great choices to make. Save a trip to the Mall and allow me to be your Personal Artist. I ordered this for my niece and it turned out so cute! The cute tissue paper it came wrapped in was a nice touch. Order arrived quickly. No complaints here! I ordered this as a birthday gift for my 10yo, one week before I needed it. Nataliya was so responsive and worked quickly. I received it with a couple days to spare. The butterfly looks very nice - I ordered white and Nataliya recommended I add glitter, which does look good. The butterfly holds many pairs of earrings, and I’m sure will be useful for a long time. The quality is very good, made of wood. I gave 4 stars, rather than 5, only because the backside of the butterfly shows the mesh material stapled on, and would look nicer if the mesh was placed between two layers of wood butterflies so that the staples were hidden. It’s not a big deal since this will sit on a dresser and the back will be to the wall. 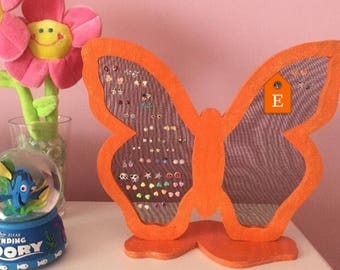 I just received the butterfly earring holder that I ordered for my daughter's birthday. It is beautiful! I can't wait to give it to her! 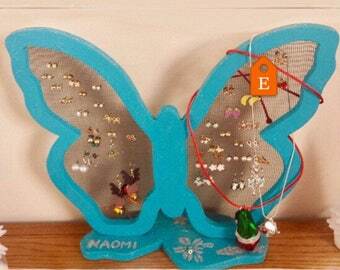 As you can see our butterfly earring holder can easily fit 40 girls earring studs. Thank you, Melissa, for sharing this picture with us. We are glad Naomi liked her gift. Feel free to order one in your favorite color this weekend. "We keep her "any day" earrings on one wing and her "holiday" earrings on the other wing, to help her know what's appropriate to pick. She loves it! Orange is her favorite color, and the subtle glitter is a great touch. It holds so many earrings!" I have been a professional Master Crafter/Artist specializing in filigree stainless steel wire technique for the past 7 years. I received my training in Moscow Russia at the private jewelry school where I lived as an apprentice for 6 weeks. After graduation I built my first studio in the back of our house in NC where I spend most of the time making jewelry. Every piece of jewelry is made from stainless steel wires that are hand woven and welded using spot welder. There are several stages in making each piece. First the frames are made. I have created steel plates in school and the wire is bent around them to shape the piece. Then all the leaves are hand woven separately to go inside the frame. Multiple short pieces of wire are cut to hold pearl, garnet, coral or amber beads embedded inside. All separate parts are laid out like a puzzle to complete the art piece and then welded one at a time until jewelry comes to life. Once everything is welded, the polishing and buffing stages complete the process. It takes a long time to make each jewelry piece. I do a lot of custom work so you can send me personal massages to request a special piece designed for the occasion. My collection of fashionable scarves shawls and ponchos came to life over several years of knitting with 12mm bamboo needles. I purchase all yarns from Italy and Turkey. My mother Olga Khmeleva has taught me how to knit and has worked by my side over the past 2 years. Each scarf takes from 2 to 3 hours to complete. Shawls take close to a day to complete. Very often yarns are combined to create a more complex design. I use both summer and winter yarns. My father Leo Khmelev creates all the jewelry holders in the studio that we share. He originally created unique stands for the Art and Craft Festivals to showcase my jewelry and many customers inquired about purchasing them. So he started making them for sale. Each jewelry stand has been cut out from the plywood and then thoroughly sanded. Leo applies two coats of paint to each stand and then glitter glue to finish the coating process. The stand holding the butterfly is the cut out from the wing and has two screws at the bottom to hold the frame. The bottom of the stand is not painted and shows natural wood. I helped staple the mesh to the back of each display. In 2013 I have devoted more time to Fine Arts when I started writing poetry. All my poems are true stories about real life situations that happened over the years. My poems come to me as visions when I meditate and I try to write them down before I forget what I see. I hand write my poems on canvas or print them on my original photo works. Even though English is a second language to me the passion and emotions come across vividly as my customers have told me. Almost all images featured on this site were taken by my sister Ksenia most recent family member to join the team!!! I thought I would have to wait for my daughters to start college and build me a website. Now the wait is finally over. What I could not do in 8 years my sister accomplished in 3 weeks.